Kate receives a call from her old friend Archibald Jones, a professor who’s an expert in ancient civilizations. He asks her to retrieve a very important briefcase from a secret location in New York City and deliver it to the authorities, but before he can explain further, Kate hears voices and then the call ends abruptly. Help Kate save her friend and find the mysterious briefcase! Travel across the world in Millennium Secrets: Emerald Curse, a fun Hidden Object game. 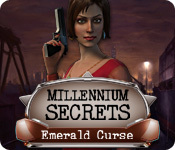 Millennium Secrets: Emerald Curse is rated 4.2 out of 5 by 27. Rated 5 out of 5 by SparkleGlow100 from ENJOYABLE ADVENTURE & PUZZLE - NO HOP SCENES (Available at BFG since 2011 ) Uncomplicated, relaxing, adventure! You’ll visit 3 or 4 different environments on your quest to rescue the professor and discover what’s going on: a dockside warehouse, various rooms, labs, underground caves and even a ocean themed indoor park! … Good cut scenes provide the necessary explanations. In most chapters and scenes you have to collect several of a particular item hidden IN or BEHIND other objects. In Casual, the giveaway is that the cursor begins to sparkle. The screen has arrows at the side that gives you a static change of scene to the left or right (no dizzying 360 rotation). I didn’t find the arrows distracting. GRAPHICS: Pretty basic, but CLEAR with good color and spacious. SOUND: - 2 Music and Sound. Music is totally separate to everything else. Effective music that I could listen to for 10 to 15 minutes at a time. Enhanced the experience of being on a mission. The game isn’t huge on environmental sounds, but it was good enough. HOPS: NONE PUZZLES: Plenty of mixed ability. HINT: You collect hints from special items, which change per chapter. If you run out you just don’t get instant hints and have to wait for a bit, for a recharge. DIFFICULTIES: 2 and interchangeable from options. JOURNAL: Contains TASKS. MAP: Not required due to game being chaptered INVENTORY: VISIBLE at all times. CHARACTERS: Characters act in a realistic manner. You play as Kate, who is a respectable and savvy agent. I liked the mix of characters involved. They were done well, and appropriately voiced. Rated 5 out of 5 by LunaNik from Gameplay, graphics, music, storyline...all amazing! REVIEW BASED ON completed game DEVELOPER JetDogs Studios GENRE Interactive Hidden Object Puzzle Adventure intrigue, spy, mystery, conspiracy STORY A devastating explosion has uncovered a secret bunker and a hidden cache of an unknown energy source. Reprise your role as Special Agent Kate McCormick. You'll need all your skills to uncover the conspiracy behind the enigma that is Roxanne's Necklace. From the secret bunker to HQ, from deep in the jungle to the ancient streets of Rome, follow the clues and solve the mystery. 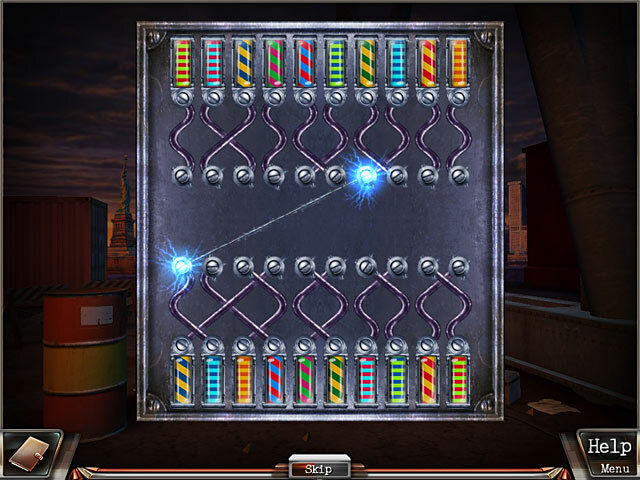 GAMEPLAY Millennium Secrets is not a traditional iHOPA. Rather, it's more like an old-school adventure game with HO scenes added in here and there. Each area or room is panoramic, meaning that you can view all parts of it by navigating left or right. Items are hidden in a number of ways, and some are stand-alone objects while others are parts of collections where you must find all of the items before you can use them. INTERFACE The map shows active areas and transports and the journal collects clues, notes the story, and lists your tasks. The hint function is direct both within a HO scene and in adventure mode. GRAPHICS & ANIMATION Both graphics and animation are well-rendered, and each scene has amazing dimension through the use of light and shadow, color and texture. Also, this game has some of the best and most lifelike Posers we've seen. MUSIC & SOUND & VOICEOVERS Rather than having a repetitive musical theme, the devs chose to create mood through the use of beautiful ambient soundscapes, which is also reminiscent of old-school adventure games. And so much better than melodic music that becomes annoying! The voiceovers were truly professional, to the point that I actually did not skip through the text. ANALYSIS The storyline was captivating and dimensional with the inclusion of sub-plots and personal touches that made it easy to identify with the game characters. Characterization was excellent. Graphics and animation were truly gorgeous and, along with the soundscapes and method of gameplay, made it easy to become immersed in this game. I highly recommend it. I'm off to purchase Millennium Secrets: Emerald Curse so I can accompany the plucky and resourceful "Kate the Great" on another adventure. 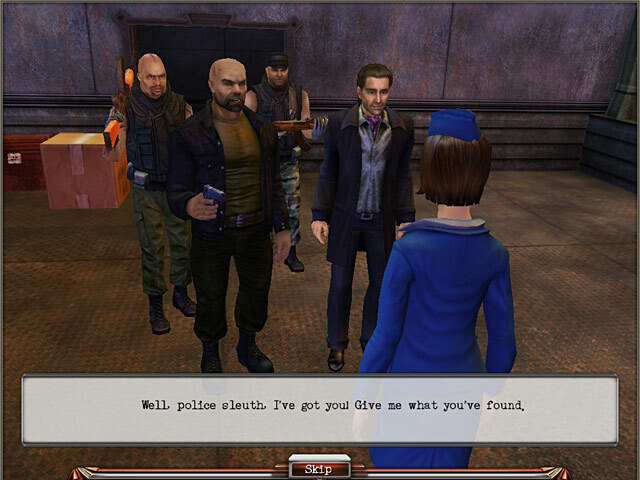 Rated 5 out of 5 by sportygal2009 from Hey Big Fish More Millennium Secrets Games PLEASE - Review of Completed Game Story: You take on the role of Kate McCormick and you receive a call from your friend Professor Jones who's an expert in ancient civilizations to find a mysterious briefcase in the Hangar No. 9 in New York City that needs to get to the authorities before it gets into the wrong hands. CHAPTERS: 6 2 PLAY MODES: CASUAL: This offers a tutorial, faster hint recharge, and a Skip button, and the cursor will sparkle when you are able to interact with an item. ADVANCED: This has no tutorial, a slower hint recharge and Skip button, and no cursor sparkle. I played this mode and you can also earn extra hints by finding bonus items. JOURNAL: This is down at the bottom and keeps track of your tasks that you have to complete and also crosses them off once completed along with keeps track of notes for some of the puzzles. There is NO map. GAME PLAY: This is a point and click adventure game. There are NO HOS. Use the arrows on the left and right to move to the next scene.When you are in a close-up, click the down arrow to exit. This is also A LOT of clicking around to "activate" something in the scene. Once you "activate' something you are shown how many you have to find and they go into your inventory down at the bottom. Also be sure to go over the areas pretty thorough as some items can be missed. INVENTORY: The items in red will show a picture (key for example) and how many you have to find. Once you find them all and can use in a scene the color changes to green. PUZZLES: There are quite a few puzzles to this game and for me they varied in challenge. Most I found pretty easy but I did have to skip a few. For the instructions you click on the HINT down at the bottom. It doesn't take away from your hints. There is a skip button at the bottom as well. This takes a few minutes in Advance mode. OVERALL IMPRESSION: I'll start by saying this is the first game in the series as the second one is Millennium Secrets: Roxanne's Necklace which I played first. It doesn't matter though cause they are both different stories. Just like Roxanne's Necklace well I was hooked to this Emerald Curse game from the get to and held my interest to the very end. I had no problem with the graphics. A very well done here. I enjoyed the story, liked the characters, game play, and voice overs. Speaking of the story though at the end of this it does say "to be continued" and I'm not quite sure what that means as I felt I had a completed game when I got to the end and as I mentioned Roxanne's Necklace was done after this game but doesn't "continue" this particular story as it's a different story. Maybe the developer here just meant that there would be more Millennium Secret games which the Roxanne's Necklace followed this? I do however have one minor criticism about this game but not enough to bring down the rating and that is: When I had to use the hint it showed me where the item was and not always in that same scene but when I would click there, it wouldn't pick up the item but take me back to where I was originally and then I had to go back again to that scene to get the item? The hint didn't work this way in Roxanne's Necklace. GAME LENGTH: This was about 6 hours for me. May be more/less for you. Overall though a 5 stars from me. I enjoyed this very much and so much that I wrote into Big Fish Customer Service to see about getting more of these Millennium Secret games or at least something similar. It may be too repetitive and "dated" for some but not me. Loved it. More like this Big Fish PLEASE. As always, give it a whirl and decide for yourself. Rated 5 out of 5 by terricT from Excellent adventure I'm impressed by the game. It really plays like an adventure story with excellent pacing. You are never bogged down by cumbersome puzzle scenes, since everything moves along smoothly. A big bonus is no hidden object scenes, hence no staring at the screen for impossibly small items. Great hint system. First of all, whenever you need an item, it shows up in red so you know what to look for. The item turns green when you find it. Then there are the bonus items, which give you extra hints. I love this story and would get the next game in the series. Rated 5 out of 5 by game_happy from THE WAY A GAME SHOULD BE DESIGNED!!! First of all, I want to look like Kate!!! LOL Avatars and VOs are excellent as well as the storyline with a surprise ending. Scenes were great. I usually am a fan of straight HOs so I would have to classify this game as more of an adventure with HOs and puzzles thrown in. Something new for me and I loved it. Think I will continue to look for this type of game from now on. You have the opportunity to collect items along the way for extra hints since the hint button does not recharge as in a regular HO. There is a skip button. If my memory serves, the dev is JetDogs. Bravo to JD!! Please continue to produce more of this type of game. By the way, James was a total babe. LOL A must buy!!! Rated 5 out of 5 by neilskinut from Loved it Not the normal HO game but fun to play. Good story line. Not that difficult and keeps you interested. I really had fun playing it and hope to see another one soon. Rated 5 out of 5 by sumo61 from What a gem of a game A truly stunning adventure, not to hard not to easy?. The game moves fast so you dont get bored, once you start you want stop. Rated 5 out of 5 by SMcKinney13 from Excellent Hidden Object game I really liked the story line. The puzzles were challenging but not too challenging. 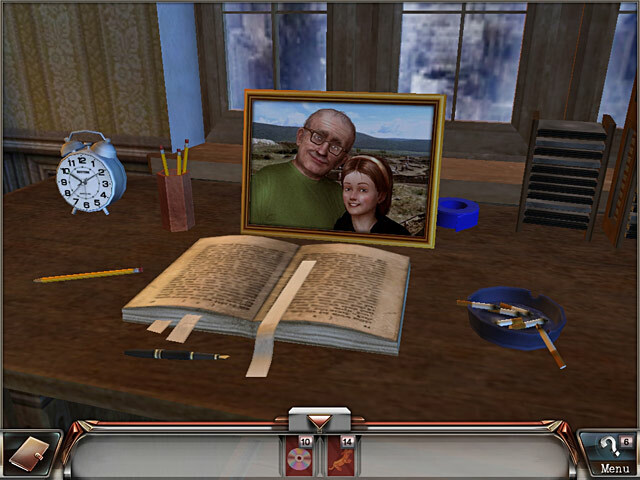 The Hidden Objects games were great. Looking forward to the sequel. Help Kate save her friend and find a mysterious briefcase! Travel across the world in Millennium Secrets: Emerald Curse!